Youth'n Up your life, news, marketing, print and broadcast media with expert Dr. David Demko, since 1974, serving the Fortune 500, licensed professions, radio and television networks, public service foundations, and government agencies to better to serve Aging America and promote optimal aging, healthy longevity, and secure retirement. 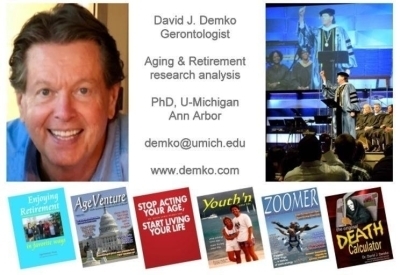 Only one-in-ten boomers manage to achieve successful retirement, a top-tier status championed by gerontologist, Dr. David J. Demko. Guided by David's trademarked "Optimal-Retirement-Readiness Strategy" (ORRS), clients learn to achieve a healthy, affluent, and robust retirement. ORRS is multi-disciplinary and comprehensive. David's award-winning public and private sector ventures consistently receive high praise. Count on his unique gerontology credentials and business savvy for personal retirement planning and award-winning ventures into the longevity economy. Zip TV, . Zoomer Nation, . 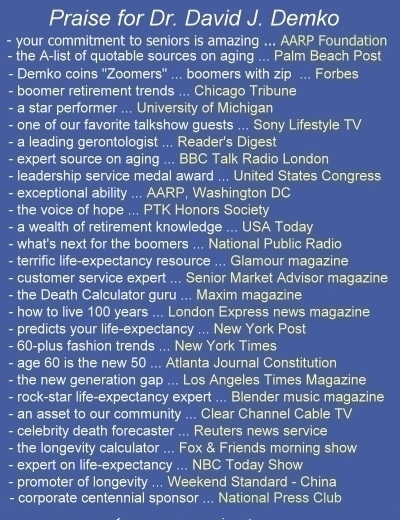 ZOOMER magazine, . OPALS - Older People with Active Lifestyles.